Halloween Skulls Ready for Year two - Halloween Discussion Forums, Costumes, Horror! 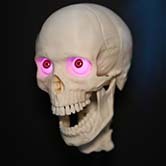 Halloween Skulls (https://halloweenskulls.com) is ready for Halloween already. We have already started sales of our Animatronic 3 Axis Talking Skulls back in February! Please come and check us out. By Halloween Season, we hop to be ready to offer our Animatronic Skeleton Arms to go with the 3 Axis Skulls. We make our own DMX servo control boards and they are included with our skulls. Here's a demo video that shows what we have to offer! Hope to see you in our store this year!